Ah, racial politics. Anxiety-studded star of a few hundred conversations in coffee shops and pubs. It’s not that the constant deluge of injustice and anger in the world is depressing, it’s that it’s utterly depressing. Talking about it at all, let alone making comedy out of it, is like trying to tapdance your way through a minefield. One false slip and you’re either offending, rehashing or – perhaps worst of all – inadvertently punching down. And even if the comedy’s coming from a true, honest voice, the risk of creating “zeitgeist-y” work with little staying power looms ever present. Needless to say, the prospect of reviewing James Ijames’ “White” filled me with tentative hope and cautious apprehension: what I got in return was a wonderfully slanted commentary on modern sociopolitics, and enough comedy to keep me from realizing I was learning until it was far too late to stop. Based on a true series of events surrounding the 2014 Whitney Biennial Exhibition of Contemporary Art, White tells the story of white artist Gus (Levi Mattey), who hires African American actress Vanessa (Anna Phillips) to present his work as her own, thus defaming an exhibition he was unable to qualify for. From this fairly simple starting point comes a flurry of emotionally charged and often absurd vignettes, examining the morality of racial curation and the various chasms which still exist at the intersections of ethnicity, sexuality, gender and identity. First and foremost is the skill and timeliness of Ijames’ writing. White, in many ways, is a clever sleight of hand: the charged subject of race never leaves the stage, and yet seems to disappear beneath illusory hand waves of wit and stinging turnaround. Before you know it, you’re considering your own place in the debate, unconsciously picking apart what is satire and what isn’t. It’s the kind of theatre that is sorely needed in a climate that often seems paralysed in the face of despair. That illusory quality is helped vastly by the show’s comedic direction: energy is the word of the day, and Nathaniel Brimmer-Beller has packed it like gunpowder in an old rifle. Despite the open elliptical shape of St Cecilia’s Hall, this production turned into bouts of verbal tennis, firing jokes so quickly across the room that distance seemed almost to help it. Of course, with a base of clear talent, it’s easily done: Mattey does an extremely laudable job at portraying a character who seems to flip between main antagonist and protagonist with every sentence, and yet still seem jaw-clenchingly consistent. In a similar vein, Phillips’ pulls triple-duty in a trio of roles (one a role within a role), rolling them out chameleon like: same silhouette, but vastly different vibes and patterns. Supporting, we have Bradley Butler as Gus’ boyfriend Tanner, and Jess Butcher as museum curator Jane – though to relegate them to ensemble would do them injustice. The production would not be half as good without Butler’s caring, vibrant foil to Gus’ ironclad self-interest; and to say too much about Butcher’s portrayal of Jane would ruin some of the best scenes going – I can say only that themes of duality and hypocrisy are shiningly represented. So, in such a shiny show, what didn’t go so smoothly? Unfortunately, a few stylistic kinks along the way are enough to turn what could be a smooth ride into something bumpier. Though the comedy seldom suffers from the almost breathless pace of the dialogue, there are times when certain lines, actions or even reactions could have done with more time to breathe. Especially in the third act, when things get heavier than ever, I found myself wanting to wait a little more in the questions before being whisked off to more one-liners. And it’s that same breakneck paceyness which turns some of the show’s more surreal moments into missed opportunities. Without spoiling too much, part of the joy of this show is how left-field the ending is. But buoyed on its own wild momentum and without enough time to properly clock what was happening, genuinely interesting satire ended up feeling more muddled than biting. Without room for contrast, the energy seems to dip without ever getting lower, like getting used to the temperature of shower water. And while scenes of sexual intimacy are intimate and very well done, the same cannot be said of the show’s flirtation with day-to-day romance. A very certain scene makes it abundantly clear that Mattey and Butler can play off each other wonderfully, but there seems to be an odd sterility to their interactions in the wider world of the play. The words are right but it lacks passion and force. So what does this all add up to? And, maybe more importantly, how does this all play into a rating? Put shortly, this is an incredibly important production, marred by a few key flaws. Even if there are elements that could be improved on, White is a show that I wildly encourage everyone to see whilst it’s here – and to endeavour to seek out when it’s not. The best theatre is the kind that leaves you fundamentally, and almost unwillingly, questioning yourself. By that metric, White certainly doesn’t disappoint. 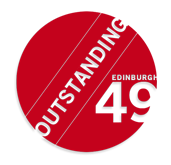 Visit Edinburgh49 at Other venues.